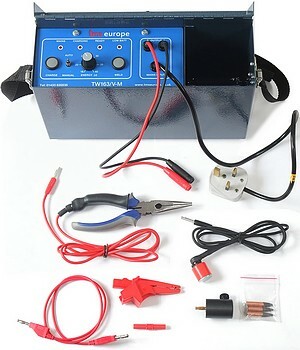 TMS Europes TW163 is a capacitance discharge welder designed primarily for thermocouple welding. As well as welding fine wire thermocouple junctions, it can also weld thermocouple junctions onto metal bodies for surface temperature measurement. Applications include thermal surveys of autoclaves, ovens, furnaces and HVAC systems. It is small and lightweight enough to be carried and used by engineers anywhere on a plant, including confined spaces or with onlyone hand free. Able to run off of its internal battery or the mains, the TW163 Welder designed for use on-site or in the workshop to weld fine wire thermocouples junctions up to 1mm diameter. Unit can operate from Mains supply while recharging battery. Mains LED shows when the battery is on charge. Low Battery LED shows when the battery needs re-charging. Tool storage is built into the case. Very low battery inhibits operation. Supplied with tools and mains charging lead. Supply voltage: 230Vac (200 - 260Vac) OR 115Vac (100 - 130Vac) - Depending on model selected.